In a recent podcast, Dan Hughes pointed out the classic “manager with old text books on desk” that say, I used to be a techy and one day I just might go back. I noticed these on my Managers desk yesterday. Honestly, I’m not sure whether to laugh for cry but I had to take a photo. Exhibit A – the plastic ruler thing is what we used to draw flowcharts for programming before Visio existed. It has the same shapes that we use today, and you used a pen to draw around those shapes on paper. 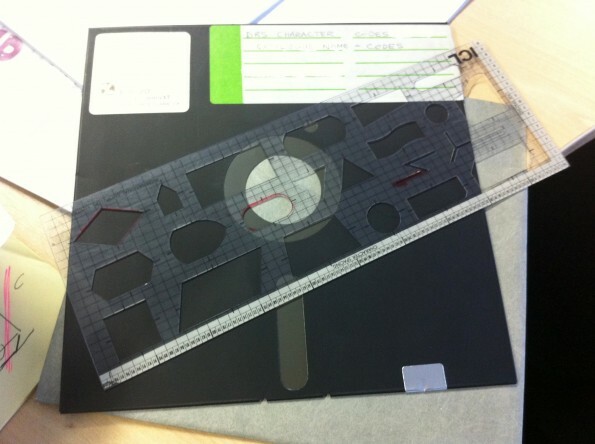 Exhibit B – an 8″ Floppy Disk with 360KB capacity. A great image for me to imagine. It would be even better if he had the drive on his desk!! Ahhaa so that’s how analog Visio looks like! And for different sizes you need to buy and install different version I guess. I was having this same sort of discussion with someone. All of the network staff in my office have way outdated books they display proudly in their cubicle. So what if its server 2000, or an 11 year old Cisco textbook. Nothing has changed right? The books never cover what we have in service. Okay my manager’s turn… he has an official Cisco print copy of the complete IOS 12.0 command reference and configuration guides along one wall. You read that right… 12 point zero. Maybe there’s someone noisy in the next office and it’s doubling for good insulation? That was the last manuals that Cisco printed, I remember them well.